Update May 2016: Please be aware that in the comments below Radu D & Jimmy say that you nowhave to get the bus back to the city through door 3 due to a new traffic pattern. Please take this into consideration when you take the bus there. If someone else can confirm this please let us know. 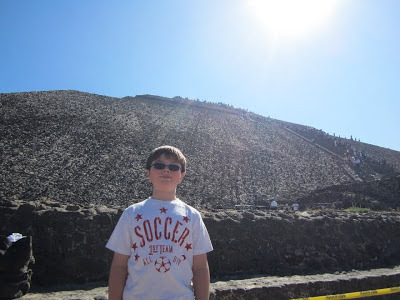 You know the pyramid of the sun is going to be awesome when you get to the top. But, do you know how to best reach the top? First you have to get there! 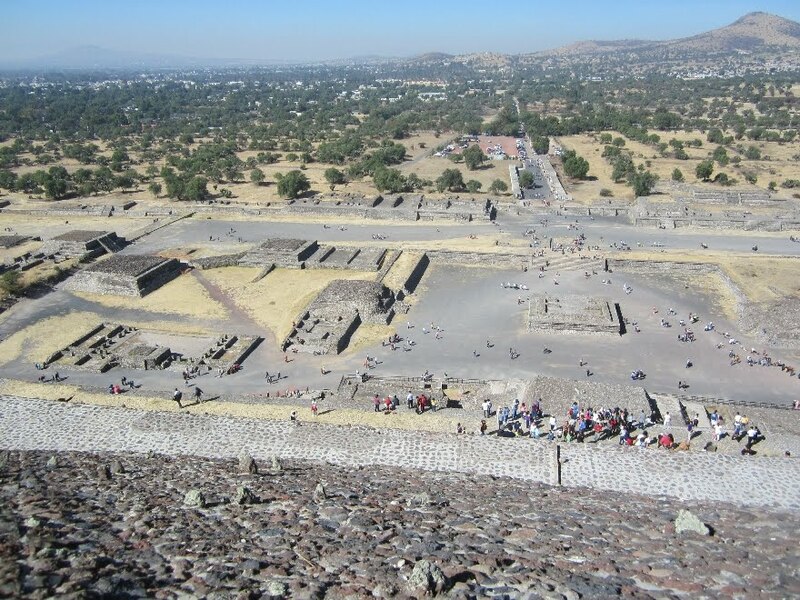 One of the greatest archaeological sites in Mexico is the ancient city of Teotihuacan. Located just an hour from the city it is a must see. You can get there by taking an arranged tour but there are good reasons not to. 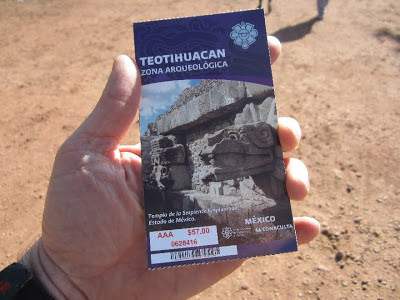 The guys at the Hedgehogs Without Borders blog summarises why you should not take a tour in this post: Taking a Tour to Teotihuacan. By doing it on your own you will certainly save a ton of money, a little bit of time and regain complete control of your trip. 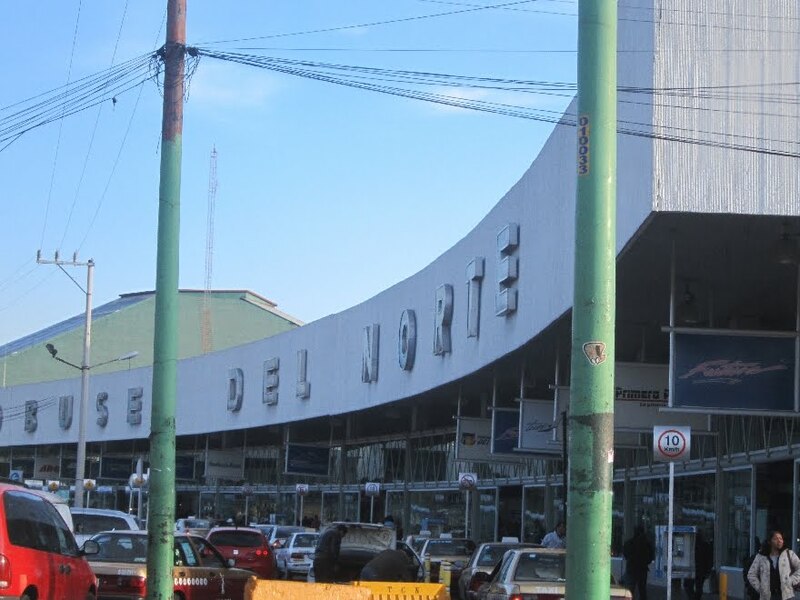 Additionally, if your already traveling independently to Mexico City you certainly don't need to be led around like sheep in a tour group. 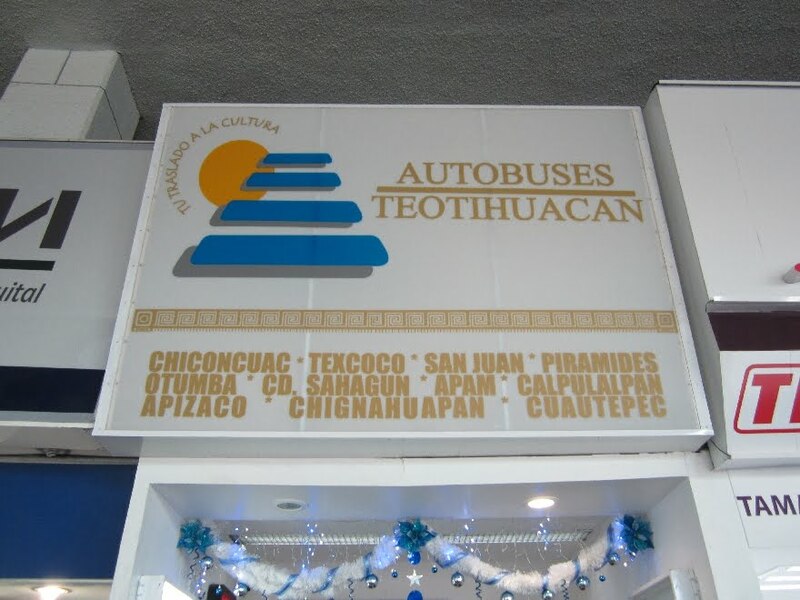 You are looking for Autobuses Teotihuacan which is one of the last desks at the end of the terminal. Just look for the blue pyramid on the sign. Inside there is a small desk with the departures listed. Buses to the pyramids leave every 15 minutes. Just say "Piramides" and you should get the correct ticket. We went on a weekend at 8:30 am and you should probably try to be there even earlier. Your goal is to get there before the tour buses arrive which is around 10:00am. Your ticket will have the departure time and an assigned seat. Cost as of 2012 was 40 pesos (about $3) and a child ticket was half price. Our bus left from platform #7. 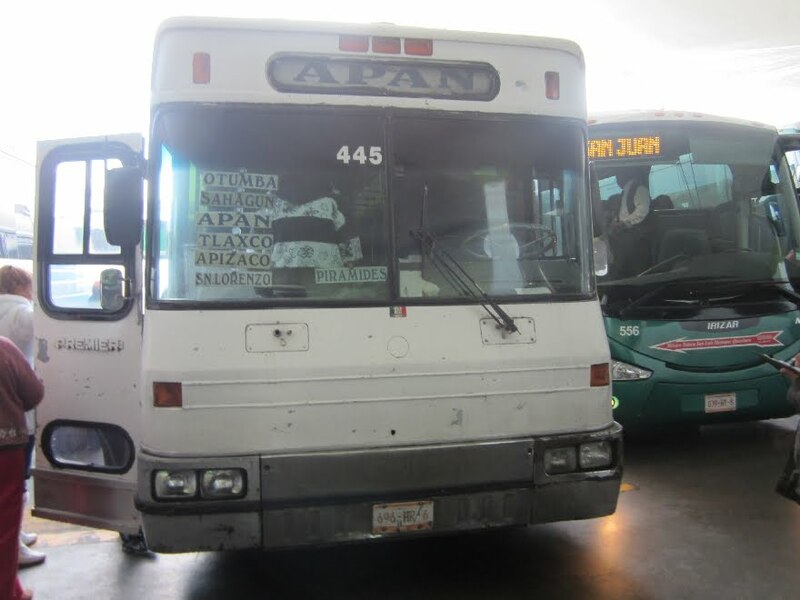 From our experiences taking buses in Mexico the time on your ticket is more likely to be the time that your bus pulls into the terminal, rather than a precise departure time. At space #7 there were two lines, one for a bus that was departing and one for our bus which didn't arrive yet. If your uncertain just ask someone who looks like they know what they're doing. The bus goes to more destinations than just the pyramids but if you look at the plaques on the front window you should see "Piramides" listed. Our bus was pretty run down and in rough condition with torn upholstery and cracked side windows. The trip only took 55 minutes so it was not a big deal but a nicer/cleaner bus would have been better. The route is mostly highway up to Teotihuacan but it takes about 20 minutes before you get out of the city. Your bus will pick up other passengers along the way in the city and at a few bus stops along the highway. It was new years weekend when we went and our bus was packed to standing room only. After the 55 minute trip our driver announced "Piramides" several times and we got out, along with half the bus at the main entrance to the pyramids. The bus will drop you off at "Puerta# 1" but you don't have to walk back here to get back to Mexico City. 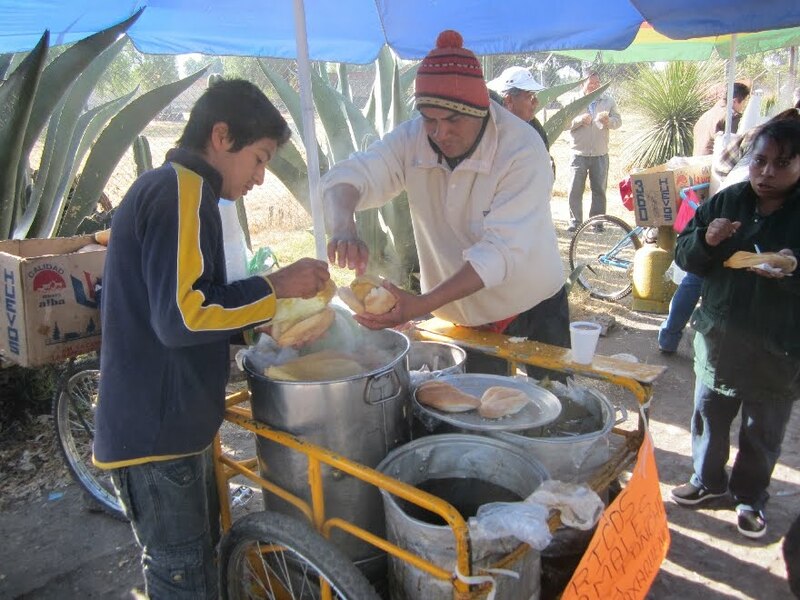 If you didn't already have breakfast splurge for a tamal con pan for 12 pesos ($1) which is a tamal sandwich. Personally we prefer the verde (green chili) but there are aways several different varieties to choose from. These were the best we had on our entire trip and we tried a lot! Follow the group but be sure to buy a ticket at the entrance to the parking lot. 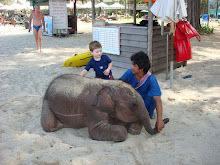 The cost was 57 pesos each (about $4.50) and kids were free. The ticket will be collected as you enter the site. 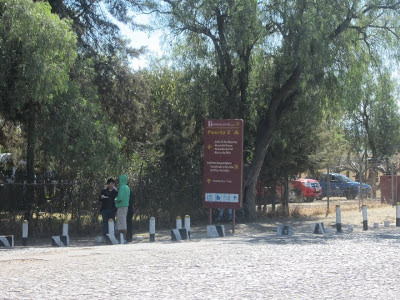 There is no place to go get a drink inside the archaeological site so be sure to buy some refreshments at the entrance. The sun is very strong so don't forget the sunscreen either. If you feel that you would like a guide that is no problem, just hire one. They will be right in front of the entrance and they will probably walk up to you asking if you need a guide. We don't know anything about the cost but if you really want to learn as much as you can give it a try. 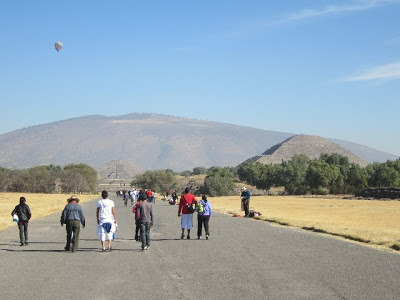 Walk along the Avenue of the Dead towards the pyramids. Since you are on your own tour you can stroll at your leisure. There were no lines when we got there but by the time we were leaving they started to form. Remember the altitude is high so take it easy when you climb up the stairs to the top. The sun is so strong. You will understand why it is called the Pyramid of the Sun. After you make your way through the site you can make your way out from the exit in front of the Pyramid of the Sun. If you didn't buy some water on the way in you are probably very thirsty by now. Unfortunately you can just buy little guitars and sombreros, the vendor selling the water is a little further towards the exit. As you exit the complex through puerta# 2 you will have to wait on the corner diagonally across from this sign. There are no markings, no sign and everyone will be confused except you, because you read this blog. To ensure you are on the correct bus look for the plaque that says "Central del NTE." Seats are first come, first serve and you can pay the driver for the ticket on the bus. 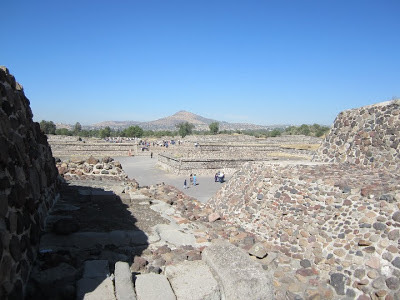 The trip back took a little longer because we had to make several stops in the town of Teotihuacan. Total travel time back to the terminal was about 70 minutes. 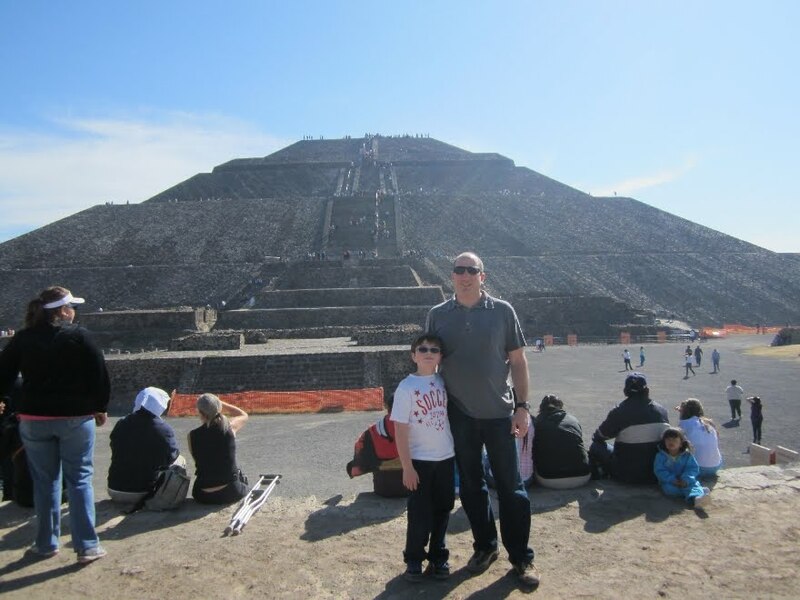 This is a great way to see the pyramids and we hope you give it a try. As always, your feedback, questions and comments are welcome. Very very useful..especially with the photographs. Thanks for taking time to share ! Glad you guys are back posting!!!! Very useful instructions. I went to the pyramids today following your advice and everything went really well. Thanks alot. Glad to hear that you had a good trip. If you have any updates or comments please let us know so we can update the blog. Great information ! Do you know if Metro is in this area as well ? "Do you know if Metro is in this area as well?" 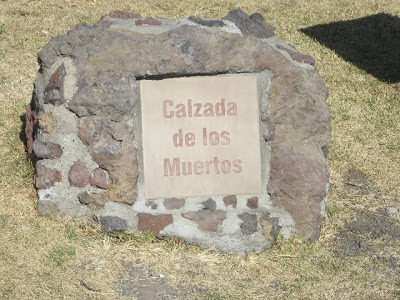 You can not take the metro to Teotihuacan. You can use the Metro to get to the bus station. Hola from Mexico city. We just returned from Teotihuacan and thanks to your wonderfully informative blog we knew exactly what to do, especially the place to catch the bus back to Mexico city. We love Mexico city and as we fly home tomorrow, we are already missing it. Thank You for all your instructions! We are bookmarking your blog it is an incredible fountain of information. Thank You for your time. Your blog is an incredible fountain of information. Greatly appreciated! Heading down to see pyramids next week. Just wondering how Mexico City was. Any restaurants you recommend? Anything close to see that is as cool as the pyramids? Mexico city is an amazing city but can be overwhelming because there are lots of people everywhere. Metro is safe, but be alert as you would anywhere. The typical tourist stuff is what we would recommend. Zocalo, cathedral & palace. The anthropology museum is a amazing. Depending on how much time you have maybe a visit to Xochimilco. Please w/b after you have gone to the pyramids to update any changes so we can keep the blog current. 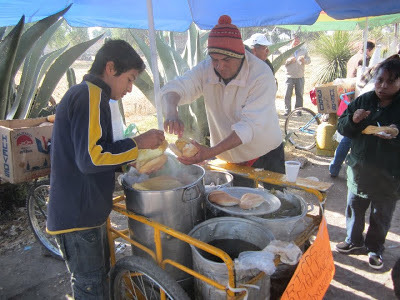 As far as food we are very big on street food and have never had a problem in 5 trips to Mexico City. Make sure you at least have some tamales at breakfast time and find some Tacos al Pastor, usually in the evening but in Mexico city it is available all day. I would find out what is best in your neighborhood from hotel. Ask hotel staff where they would go with their friends. Exceptional help! I was the Mexico City last week and each detail you provided was perfect! Make certain that you have a good guide book or map close at hand. Since I was "in the neighborhood" I easily figured out how to reach the Basilica of Guadalupe from the Pyramids. Thankfully it was almost deserted (it was a Monday in October). The basilica area was a cacophony of commercialism in stark contrast to the serenity and mystery at Teotihuacan. thanks for the info, my taxi that Ive been using for business visits wanted US$100 to take me there, wait 4 hours and come back. So I´m off on the bus tomorrow on your advice! Thanks very much, I followed this advice, and it worked well. The ticket is still 40 pesos and you can buy the return ticket at the station as well. Ur advice was awesome, thank u very much!! We followed ur instructions and had no problem at all getting to teotihuacan and back. It was a cool local experience.. And we saved $100 in the process :). We traveled in dec 2013.
thank you so much for taking the time to document your trip. I stumbled across your blog and last week we followed in your footsteps. We had a blast, a bit of an adventure and we saved a stack of money that we were able to spend elsewhere. Our hotel quoted us 580 pesos per person to do the tour! I have taken a total of 8 Spanish night classes and I am the only one with any Spanish in my family. You blog helped us navigate to and from the pyramids and my husband was a little unsure about us doing it ourselves. Now just a little pricing update. The metro is now 5 pesos per person each way. 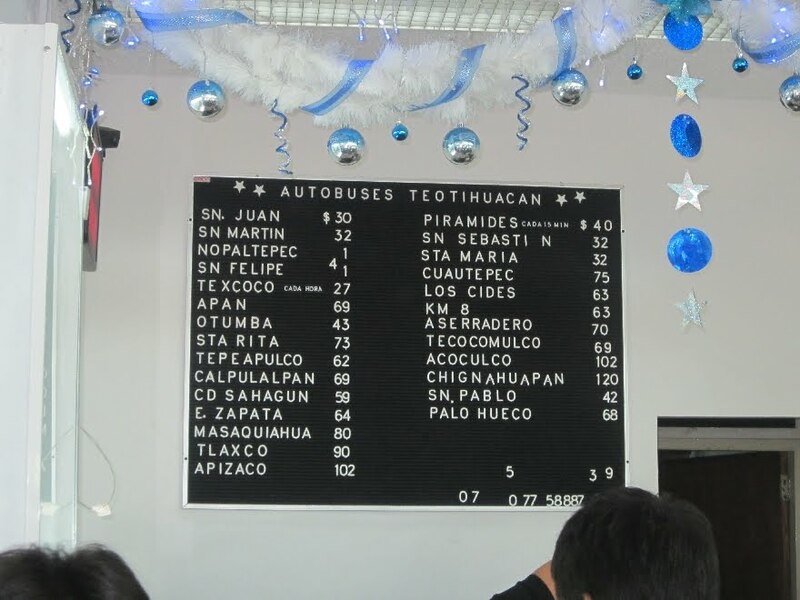 The bus tkts are now 42 pesos each way and 21 pesos each way for kids. You can buy a return ticket at the bus station before you go. 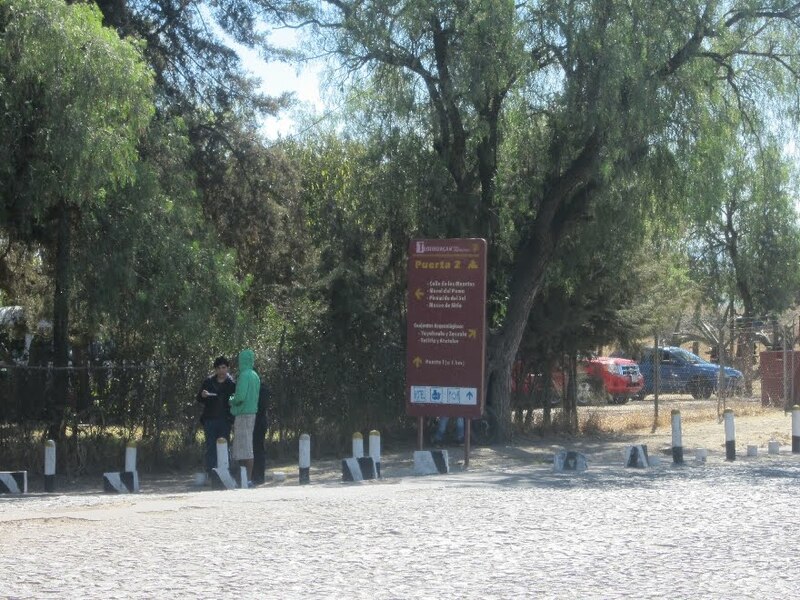 Also entrance to Teotihuacan is now 59 pesos. 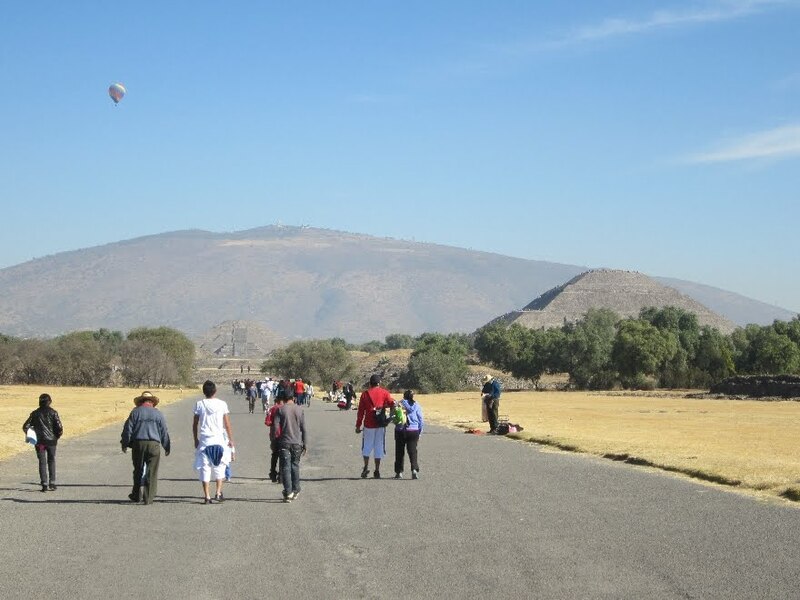 Sundays are very busy at the Pyramids as entry to all Museums/ Archaeological sites is free for all Mexican people on Sundays. All museums are shut on Mondays except Teotihuacan. Thanks so much. We are headed to Mexico City in two weeks with our 8yo and 11yo and this page was very helpful in planning. Did this trip today with no problems. Well worth it to hire a guide. We caught the bus back to town from gate 1. Thanks so much! Randomly found this blog when researching our trip to Mexico City. I wanted to say THANKS!!! This was super helpful and helped us save a lot of money by not having to pay for a tour. This helped us so much when we went to Mexico City in November 2013! We followed the instructions and had no issues! Thank you so much! Thank you! we followed everything per your recommendations and it was perfect!! Thank you so much!! Hey there, excited to use this for my travel. Do you happen to know if the pyramids are open on Sunday? Most tours are weekdays and Saturday. Maybe someone else can give 100% confirmation that they are open Sunday but I think the reason tours do not operate on Sunday is because the Shrine of Guadalupe is part of the tour and that may not be available for visiting on Sundays by tour groups. Thanks so much for this super useful info - we are headed there tommorrow and your post gave us all the info we need. Thanks for the info. I would add that you be careful with the cab drivers. When you get off the bus at Gate 1 they try to lie to you and tell you that you have to take a cab to drive you closer to the pyramids, or when you leave they try to get you to take a cab back to Gate 1 and they lie telling you that the buses only pick you up at Gate 1. Works as desrcribed! Thanks. I was worried about safety but no problem. We took a taxi to the station about 50 pesos from the center. To get back we had to catch one at the street as those at the station are organised and asked 150 pesos! There are checks at the station almost as at the airpot :-). On the way back whole bus was checked by police - bags and they filmed faces of all passengers. I can give 100% confirmation that they are open Sunday. That's the day that a lot of the local people go (it's free for them on Sundays), so it was actually a great day to go. As others have said this blog was really useful. We followed it to the letter, even packing frozen water. The only changes are that the bus leaves from Gate 3 opposite the Moon temple not the sun temple now. Same brown sign. Also don't be idiots like us! TAKE PESOS! No credit cards. No dollars. No place to exchange money. Bus only takes pesos, monument only takes pesos. We were rescued by some friendly Argentinians. Thank you friendly Argentinians! And thanks Elliot!! Thank You for your time. Your blog is an incredible helpful with perfect information. Greatly appreciated! Elliot - you are the best! we followed your advice and had the best time while navigating the different travel modes with ease. 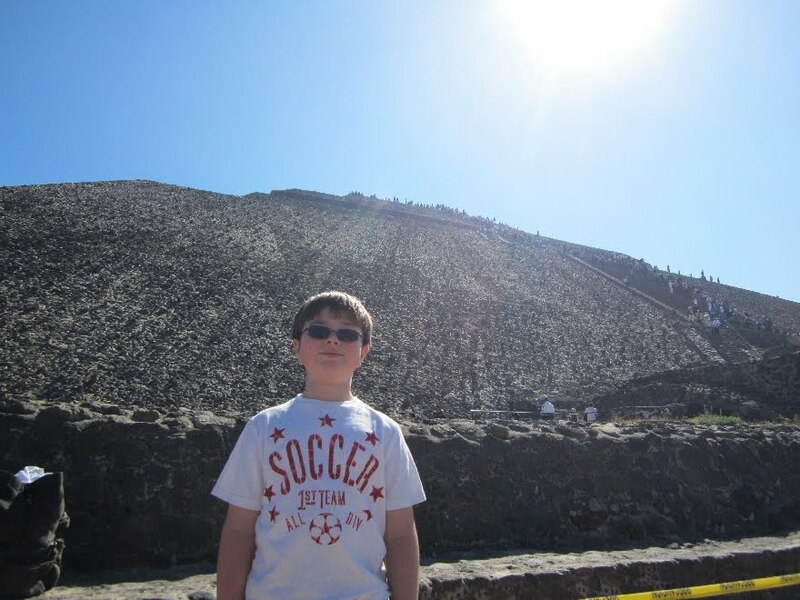 I visited Teotihuacan on September 2014. These instructions still work properly. Thank you for making my visit to the Pyramides so much easier! Just stumbled on your blog on a saturday morning in November 2014 while pondering on what to do that day. So i decided to go to the piramids. Thanks for the very detailed instructions. They are still accurate although prices have increased a bit. Thank you for these instructions! We followed them and it worked out well. We took the metro to the Autobus Central del Norte. The buses that we rode were both in quite good condition. As you mentioned, I would recommend buying 1-2 bottles of water per person (which can be bought after you arrive at the shops immediately outside the entrance to the grounds). We also bought two straw sun hats for 50 pesos for 2 hats. I'd recommend wide brimmed hats because it was rather sunny, even in early December. Also, I'd strongly recommend that people wear athletic or hiking shoes to the grounds. Not sandals, or anything with heels. The hike up the pyramids is quite steep and you need good, secure shoes. Our friends visited the Pyramids the day after we did with a private driver. 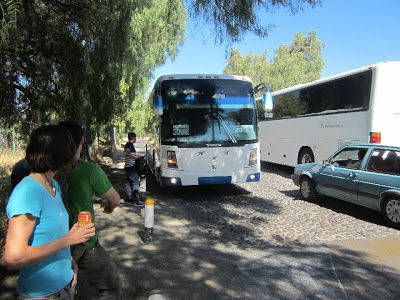 Their driver recommended and took them to a restaurant near the Pyramids called La Gruta in San Juan Teotihuacan (The Grotto). After seeing pictures of La Gruta, I wish we would have known and eaten there because the setting looks amazing. And you'll be hungry after spending several hours at the Pyramids. Thank you so much for your amazing tips and too all the comments on here. We did this today, it was exactly as you said. The bus back we picked up from puerto 3 because of where we ended but the bus drove to puerto 2 and 1 before it left, and it comes around every 12 mins until 9pm. Instructions on the return ticket that we bought when we bought our ticket form the station. 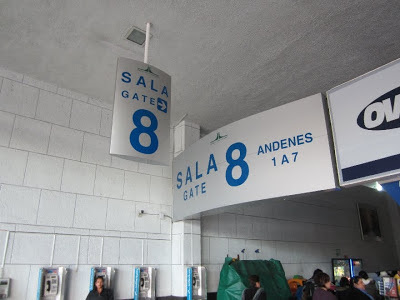 Also we got off at Indios verses as it was the 2nd bus stop back to the city and quicker for us to get the metro to zocalo! 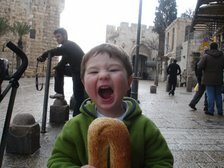 The museum is awesome and I recommend eating food in the little shaks by the shops inside the site. The tickets are still 43 one way for bus and 59 for entrance plus 45 for video cameras! Thanks again all and I recommend this trip!! All worked as already detailed, awesome! Bus is now 44 pesos, admission to the site is 64 pesos. We hired a guide for 500 pesos for 90 minutes. Worth it if you don't know anything about the site. Elliot - great tips. You saved us a ton of stress finding the right counter at the bus terminal and leaving the site. Best to be picked up by puerte 3 - beat all the people getting on at the other stops. Thank you for posting these travel tips! 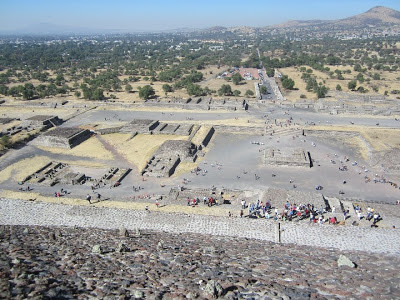 I had a great day at Teotihuacan, free of the constraints of a guided tour. I brought my own water and snacks, ate breakfast at the restaurant at gate 1. I will add that women travelling solo like me should not hesitate to take this trip, it felt very safe all along and everyone was gracious and patient with my rudimentary Spanish. We are planning to go in 2016. We will be going via a cruise ship and it will dock in Cozumel. I hope it is easy to get the pyramids from there. 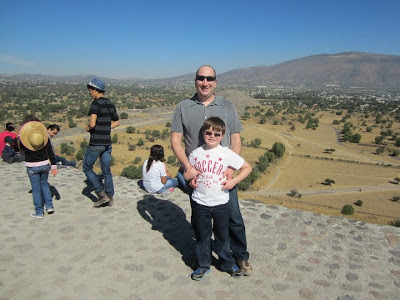 I really did enjoy your blog about the pyramids and felt I was there too! These pyramids are located outside of Mexico City. There are some Mayan ruins in Cozumel (San Gervasio) but I wouldn't go out of my way to see them. If you rent a car or scooter and drive around the island you will pass them on your way. Just went to the pyramids today. Used the metro to the bus station. Followed the blog directions to take the bus there and back...all for less than $15 dollars. No changes in information except subway, bus and entry price have increased. Went with a couple buddies on a Sunday morning. 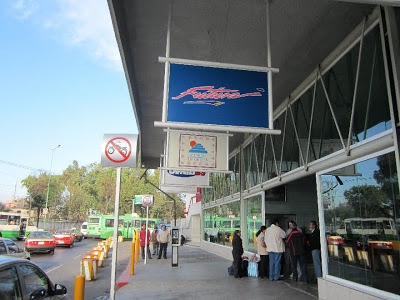 Got to "autobuses del Norte" at 7am and got tickets for a 7:20 departure easily enough. The bus didn't have a "pyramides" sign but did say "San Juan" so, slightly concerned, I told an employee nearby in Spanish that we were trying to go to the pyramids and he pointed to the San Juan bus so we hopped on and sure enough got dropped off right at the entrance. There were only 6 people on that bus but on the ride back home around 11am the bus filled up after a few stops in San Juan where there was also a quick sweep of the bus by police but no big deal. I put 200 pesos under the insole of my shoe for piece of mind but everything went great. Oh and we left from Puerte #3.. Take the adventure, it's worth it! Excellent walkthrough! I'm going for three days next February (am staying at a hotel near the pyramids) and had read a bunch of "how to's" for getting there - yours is the only one I've found with pictures! They make everything so much more understandable - thank you! I'll try to stop back and leave another post when I return to update any changes! anyone know what time the buses start running? Thankyou! I am heading to Mexico soon, this is exactly the info I wanted, and the pictures look fool proof! Hi there! 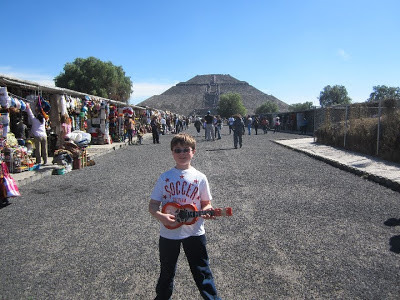 I stumbled on your blog when searching "how to get to Teotihuacan" so thank for such an informative post! I'll have to come back to your blog another time to check out your other family adventures. Thanks for sharing! I'm heading there this week. Bus is as easy as you say. Ours had the wrong sign in the windscreen but the lady checks your tickets and can confirm the correct one. Even with my the words of Spanish. Seat numbers seemed ignored but no beef there. Tickets were $44 each way. Bus stop info for return was really useful. Thanks again for the amazing information! 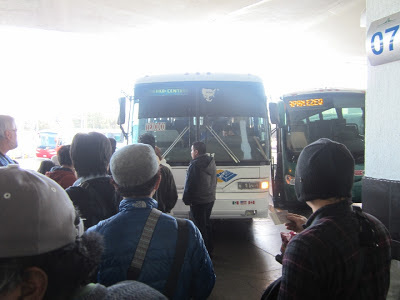 Great guide, only comment is the bus back to the city no longer leaves from Gate 1 and 2, it only leaves from Gate 3 now. Waited some 40 minutes like a good polite Canadian before a local pointed me to Gate 3. Great time in teotihuacan this weekend. I can confirm that the return bus leaves from door 3, just outside the gate. Great post . Everything was as described! Every single detail! Bus home left from door 2 . Thanks for all the help!